Review of Samuel Adams Irish Red | Beer Apprentice - Craft Beer News, Reviews, Interviews and Info. Today, for my craft beer review, I thought I would review another brew from the Boston Beer Company located in Boston, Massachusetts. The Samuel Adams Irish Red. As I have mentioned in previous reviews regarding the Samuel Adams line of beers, I truly respect and appreciate what they have to offer and what they have done to help bring craft beer a little bit of publicity. As far as this beer, I have tried it a few times, but it has been several years since I last had one, so I’m having trouble recalling what I thought of it. The website, samueladams.com, has this to say about the Irish Red. The gentle rain and fertile soil of Ireland helped inspire this style of ale, known for being remarkably balanced. Pale and caramel malts give Samuel Adams Irish Red its rich, deep red color and distinctive caramel flavor. The sweetness of the malt is pleasantly balanced by an earthy character from the East Kent Goldings hops. 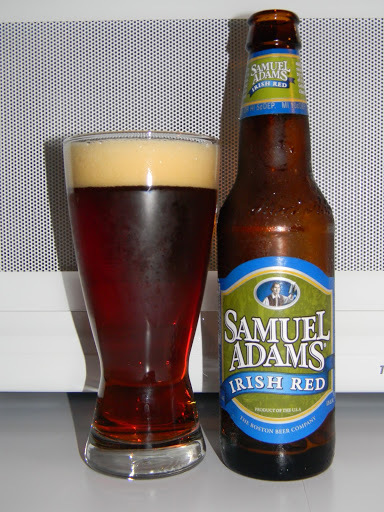 Samuel Adams Irish Red finishes smooth and leaves you wanting to take another sip. This beer is 5.8% ABV and comes in a 12 oz. bottle. The appearance was a very nice, clear, ruby red to copper color with some burnt orange highlights shimmering throughout. The head was a very light tan color with ok size, average retention and decent lacing. The crown settled to a slender ring around the top of the liquid. The aroma started with a sweetness similar to cranberry juice. Maybe even some raspberry. I’m not real sure about that, but it’s very similar if not. I detected the most faint hint of caramel malt at first, although after the beer warmed a bit the caramel became more forthcoming. The malt seemed to convey somewhat of a toasty aroma that added a touch of complexity. In the taste, I picked up some of the caramel malt, however I also found a weird medicinal, cherry cough syrup type of flavor. I didn’t care much for that really. The taste also had a touch of “earthy” hops and smidgen of bitterness. It finished with a light toasted bread savor. I’m not extremely well versed with these types of beers, so I was having a bit of trouble distinguishing some of the characteristics. Forgive my ignorance. The mouthfeel was medium, smooth, slick and dry. The palate was not left with a whole lot of flavor however. Hmm. Well, this is not my favorite effort from Samuel Adams. I do think the appearance is nice. I love the color. The taste was just a little too medicinal for me and I didn’t think that it had enough caramel malt. I could probably have one or two during a sitting, but then I would probably move on to something else. I can’t see myself wanting to try this again anytime soon. Some may find this beer to be just what they are looking for, and that’s great, however it’s just not my preferred style. Have you guys tried the Samuel Adams Irish Red? What did you think of it? Thanks for reading and commenting everyone. Have a great craft beer weekend. I'm glad you didn't give this such a good score. This beer really disappointed me. I didn't find it much better than Killians, which I liked when I first started drinking beer, but later grew to despise. I don't know what it is, but for some reason Red Ales are just not a style that I can get into. Maybe it's just me.